"Essentials of Business Research: A Guide to Doing Your Research Project" is a concise, student-friendly text that cuts through the jargon of research methods terminology to present a clear guide to the basics of methodology in a business and management context. This extremely accessible book is informed throughout by the use of clear case studies and examples that serve to bring the research process to life for student readers. Unusually for a Methods text, Wilson also explicitly considers the importance of the supervisor in the dissertation process, and explains for the reader what lecturers are looking for from their students at every stage of the process in a good research project. This book aims to guide the student through the entire research process by using actual student case examples and explaining the role of the supervisor and how to meet their expectations. Key features of this title include the following: 'You're the Supervisor' sections help students to meet their learning outcomes; 'Common questions and answers' provide students with an invaluable point of reference for some of the challenges they are likely to face while undertaking their research project; there is a comprehensive section on ethical issues students need to consider when undertaking their research project; and, a full student glossary. The book is packed throughout with student-friendly features such as helpful diagrams, student case studies, chapter objectives, annotated further reading sections and summary and references at the end of each chapter. 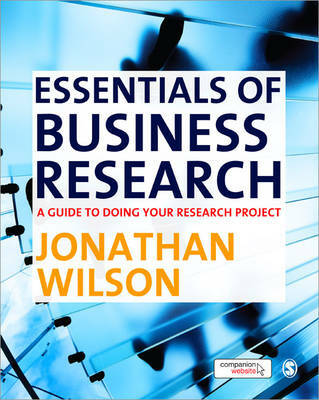 "Essentials of Business Research" is accompanied by a companion website containing an array of material for lecturers and students including: multiple choice questions to enable students to test their knowledge and progress; chapter-by-chapter links to academic journal articles demonstrating each method's application; chapter-by-chapter links to youtube resources to provide further context; and, chapter-by-chapter powerpoint slides to help lecturers and students.